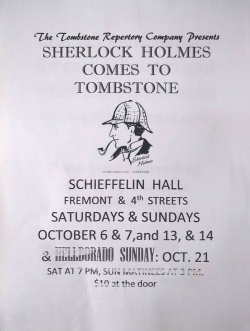 Sherlock Holmes Comes to Tombstone is an American 2-act play, written and directed by Kenn Barrett, performed by The Tombstone Repertory Company at the Schieffelin Hall (Tombstone, AZ, US) from 6 to 21 october 2018 (5 performances), starring Andrew Groleau as Sherlock Holmes and Thomas Groleau as Dr. Watson. Sherlock Holmes comes to Tombstone in 1881, early in his career as a consulting detective. A man is killed in a mine explosion. Accident or suicide? His attractive widow wants answers. 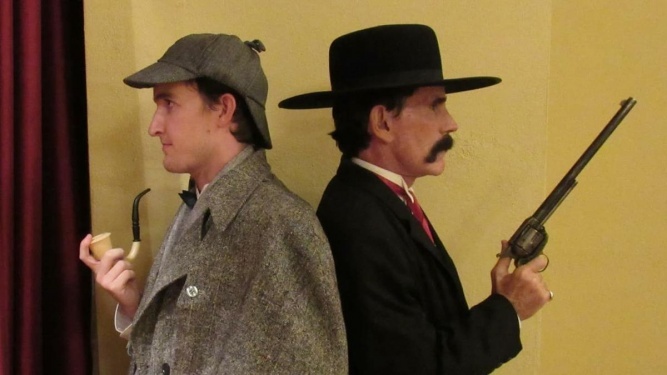 Can Holmes and Watson, with the aid of Wyatt Earp and Doc Holliday, find an answer for the distraught widow? J. M. : Barry R. Smith, Jr. Scene 1 : 221B Baker Street : "The Game is Afoot"
Scene 2 : Streets of Tombstone, A.T. : "Colorful Characters"
Scene 3 : Saloon : "A Mysterious Stranger"
Scene 4 : Saloon : "Tell No one"
Scene 5 : Mine Tunnel : "I'm your Huckleberry"
Scene 8 : Saloon : "A Not So Brief Explanation"
Scene 9 : Allen Street : "A Fond Farwell"
This page was last edited on 6 November 2018, at 00:15.